Israeli multilayer piping company SP Metzerplas visited the Plumbdrain exhibition. Company managers Omry Lev, Yoav Ben Naphtali and Ilan Mizrachi, took the time to talk to Plumbing Africa on the development of a new piping technology, the challenges of accreditation, and the threat of inferior products flooding the market. Yoav Ben Naphtali says that Metzerplas was the first company to develop and patent the multilayer piping system. SP Metzeeplas director Mario de Freitas, with SP Metzeeplas international liaison to Israel Ilan Mizrachi, Yoav Ben Naphtali and Omry Lev. “Metzerplas wrote the patent on multilayer piping in 1983, making it the very first producer of multilayer piping in the world,” he says. Metzerplas also developed the first multilayer pipe manufacturing machine, bringing a new product to European markets. 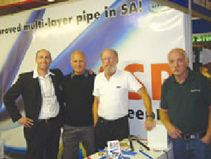 SP Metzerplas would wait twenty years before introducing the piping system to South Africa in 2005. “The South African market was known as a conservative market- one not given to readily change to new products. However, once multilayer piping took off in the country, we have seen a marked growth in interest from the plumbing industry,” Ben Naphtali says. The biggest problem with multilayer piping, though, was the absence of an industry standard to measure multilayer piping against. After a two year period of extensive lobbying through the newly established South African Multilayer Piping Association (SAMPSA), multilayer piping suppliers received the SANS 21003 standard. This standard, which is based on the traditional ISO: 21003 standards, enabled the companies to obtain accreditation for their products. SP Metzeeplas was the first of the South African multilayer piping companies to receive the SABS mark on their products. “By establishing the standard, the South African market is now ensured of a quality product,” he points out. Multilayer piping is used in Europe as underfloor heating piping. Locally, Ben Naphtali foresees multilayer piping being used to supply hot and cold water to homes. Since multilayer piping is a plastic, it cannot corrode, while the smooth inner-surface eliminates calcium buildup in the pipes. Ben Naphtali says that the combination of aluminum and plastic gives the multilayer pipe strength, a longer lifespan, and makes it bendable. The addition of aluminum also negates thermal memory, which means that the pipe will not unbend. Multilayer piping also needs less components for installation and thus also less labour. “The main problem with multilayer piping systems is the flooding of the market by inferior products. These products are manufactured from cheaper raw materials, but are not as strong as approved multilayer pipes. This could potentially damage the image of multilayer pipes, and it is therefore very important that suppliers choose their products very carefully,” Naphtali says. Metzerplas is currently involved in developing a training program to show installers how to fit multilayer piping systems. “Our special range of products are made to last, but needs to be fitted properly to be 100% effective,” Naphtali says. He concludes by saying that SP Metzerplas is convinced that it can make a difference in the local market by uplifting standards and supplying quality products.